Martin Denny. Les Baxter. Arthur Lyman. They are the greats of the classic exotica world. However, I think there’s a name missing from that list: Robert Drasnin. Granted, he’s only released two exotica albums, Voodoo and Voodoo II, but I think their quality and importance more than makes up for the lack of quantity. The Voodoo series actually has an interesting history. Back in 1959, Drasnin composed Voodoo for Tops/Mayfair Records. Tops re-released it a year later with new cover art and under a new title: “Percussion Exotique.” It wasn’t until 1996 that it was reissued onto CD by Dionysus Records. That same year, Pickwick Records (then owned by the now-defunct video company Simitar) released a CD called Exotic Excursion which was made up of 10 of the original album’s 12 tracks. However, while the Dionysus release was mastered from a previously unplayed record, the Pickwick release used the original master tapes from the 50’s. Why two different companies released CDs of the same material using different masters (and why the one using the master tapes didn’t use two tracks) is a mystery to me. 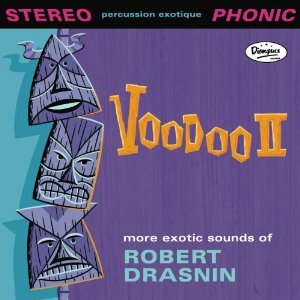 After the original release of Voodoo, Drasnin performed as a musician in numerous other albums, did work on television shows like Lost in Space and The Man From U.N.C.L.E. He even became CBS’ Director of Music in 1977! According to the liner notes, the idea to create a sequel to his hit exotica album came in 2005, after the tremendous response to his liver performance of selections from Voodoo at the Hukilau Tiki festival. Two years later, Voodoo II was released. As you can see, this was a true labor of love and not a quickly slapped together cash in. In fact, the resulting sound is so rich (thanks to the use of so many instruments) that my write-up can’t cover them all! “Habanera In Blue” opens with claves, bongos, quick vibraphone beats and sirenesque female vocals. Light keyboard notes play, then the piano takes us to vibes layered over cymbals or maracas. The cello joins in, along with a harp and more wordless vocals. We hear the piano again, along with the ever-present claves and bongos. The vocals reappear with cymbals, only to be temporarily replaced by the saxophone. They return with the harp, while claves, bongos, piano, chimes and gong form the ending. “Moorean Moonbeams” starts off with bongos and guiros, then the piano brings in the female vocals (with lyrics) that give this track a beautiful, otherworldly feel. Bongos, drums, cymbals guiros, cello and vibes are added as the vocals and piano disappear and reappear. The guiro, bongos and vocals are “on top” after the piano. The cello is layered as well, then later goes solo until the gongs and quick guiro at the end. As the title might have you guess, “Sambalerro” has a distinctly “Latin” sound. Our old friend the piano is mix with maracas, marimba, vibes, cello and maracas at first. Later, a flute or clarinet joins the piano, drums and vibes and this transitions to a sax over maracas and cowbell. Drums and piano turns into a piano solo and the like TV show end logo-type finale featuring a gong and light chimes. In “East of Xanadu,” the cello and light bongos are quickly followed by vocals, piano and marimba. Vibes transition to bongos, cello, marimba, and clarinet. The returning vocals are sung over vibes, drums and cymbals that to lead to a saxophone over maracas and bongos. The vocal join in and compliment the beat, then takes everything over. Piano flourishes are layered atop vibes, cymbals, bongos, and cello before the piano and harp outro. “Kahluha Mist” has a catchy “bongos and clave” beat layered under a piano, light cymbals vibes and cello. It might look like a mess on paper, but they actually go really well together. The piano gets more varied before the sax appears over bongos and percussion, which gives way to piano, vibes and cello. “Polynesian Bolero” starts off with chimes and drums, with dash of vibes and light vocals that form a slow march of sorts. The vibes get larger role with drums, then the track becomes more like a Latin dance. The saxophone and percussion beat make things jazzier before the march resumes, only to become a jazzy sax version of march layered on top of vibes. The slow vibes of “Luz de la Luna” merge with claves and cymbals (or is it maracas?). The cello plays very lightly under vocals, and drums briefly appear. These drums then give way to vibes and piano notes over bongos. Light sax notes drift in and then we get a piano solo. Bongos, sax and vocals return over the occasional bongos before the jazzy ending. The energetic exotic percussion opening of “Puente Doble” forms the track’s beat and is joined by a marimba cameo of sorts. The cello and vibes transitions to piano and keyboard breaks. Speaking of which the keyboard offers varied sounds throughout this song. There’s a neat “Peanuts exotica” feel at times to this. The marimba gets a larger role accompanied by the piano and cello and everything gets more dramatic and drum-filled towards the end. “La Mer Velours” has a wonderful piano opening with cymbals and claves, followed by vocals going in and out of the song. Bongos play in background at first, but vibes replace them later for a nice solo of sorts. The harp appears from time to time, as do the vocals. The bongos, claves and flute of “Reminiscence” are soft, slow and light. The occasional vibe work is followed by piano and is very evocative of memories. Cymbals and the cello pick things up a little bit with the vibraphone Some light, magical-sounding chimes sometimes pop in and vanish as quickly as they appeared. The cello and vibes over the back beat goes well with the piano work. “Siren Song” opens with a piano and claves backed with soft, but steady cymbals and vibes. Vocals follow soon after and are joined by the cello. It’s easy to see why Odysseus begged to be untied from the mast of his ship if this is the sort of singing he had heard. Vibes take over and the beat picks up. A quick cymbal hit takes thing back to normal and vocals return, along with a vibe flourish. Before you know it, the beat picks up again and we hear some fine cello work. Light harp strums and vocals come in, then the piano takes over but eventually yields to those it replaced. “Tahitian Dream” begins with slow cymbals and bongos. The piano and vocals join in, along with vibes, cello, and slow, smooth vocals. The piano takes the reigns again, then the vibes and cello take over. The saxophone jazzes thing up until it’s replaced by the vocals. Light gong strikes and cello bring the song (and the album) to a close. Many of you are probably wondering, “Why is the album called “Voodoo” if it has nothing to do with Africa or Haiti?” In fact, I thought something similar back when I first saw a scan of the album’s original cover art years ago. At first I wrote it off as someone suffering from cultural confusion, but that seems to not be the case. You see, during the time period the album was released, the term “voodoo” had long since been catch-all slang for the exotic and forbidden. This is evidenced by the rather unfortunate lyrics of the song quoted here. Thankfully, Voodoo II has none of that example’s potential offensiveness and is instead a wonderful listening experience.